Bloodjinn is an American metalcore band from North Carolina, formed in early August 1999 by brothers Joel Collins (vocals) and Justin Collins (drums). In September 1999 the band went into the studio and recorded their first release, entitled "To Bleed The Demon", for the indie label Flatline Records. Following the success of this release, Bloodjinn signed a record deal with Tribunal Records, better known for releasing debut albums for Atreyu, From Autumn To Ashes & He Is Legend. They began working on their first full length for Tribunal called "Murder Eternal: Seven Short Stories For The Slightly Psychotic". The band hit the road extensively in support of the release from doing dates with bands such as Every Time I Die, Premonitions Of War and Scarlet as well as hitting many notable festivals such as Hellfest and Furnace Fest along side of bands such as Converge, Hatebreed, New Found Glory, Underoath and Killswitch Engage. In February 2001, Bloodjinn made their way into the studio again to record two new tracks for a split release titled "Born In Hell, Raised In Jail" released on Tribunal Records in August 2001. Later that year, Bloodjinn inked a deal with Canadian based Goodfellow Records. "Leave This World Breathing" was recorded in January 2002. This album showed their hard work and dedication through being a concept album - written from a short story the band created. The album reflects life and how human beings often live their lives without care and concern for others, as well as holding someone inside your heart throughout life as they pass away. Bloodjinn continued to tour and play constantly until the decisions were on the table with where to release their next album. They toured and played select shows with bands such as Between The Buried And Me and Caliban to supporting Darkest Hour and Unearth to co-headlining Friction Fest 5 with Underoath and Most Precious Blood. The band also played Gainesville Fest alongside Bury Your Dead, Darkest Hour, Between The Buried And Me and more. Moving into 2007 with new material and a couple of new members, Bloodjinn signed a deal to Pluto Records and released their latest album "This Machine Runs On Empty" on March 6, 2007, and was noted as one of the stand-out albums of 2007. The band went on the road in support of the album with notable acts such as Hatebreed, God Forbid, Shai Hulud, Born Of Osiris, Dead To Fall, Vanna and KillWhitneyDead. 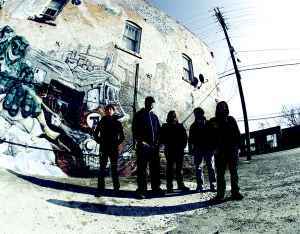 Bloodjinn were scheduled to release a new album titled "Between Breaths" in the summer of 2009. The album was planned to be released on singer Joel Collins' own record label, Forsaken Recordings (Demon Hunter / Bleeding Through / Farewell) with artwork designed by Mike D'Antonio of Killswitch Engage but ran into undetermined delays and complications and all plans have been put on the back burner for the time being.